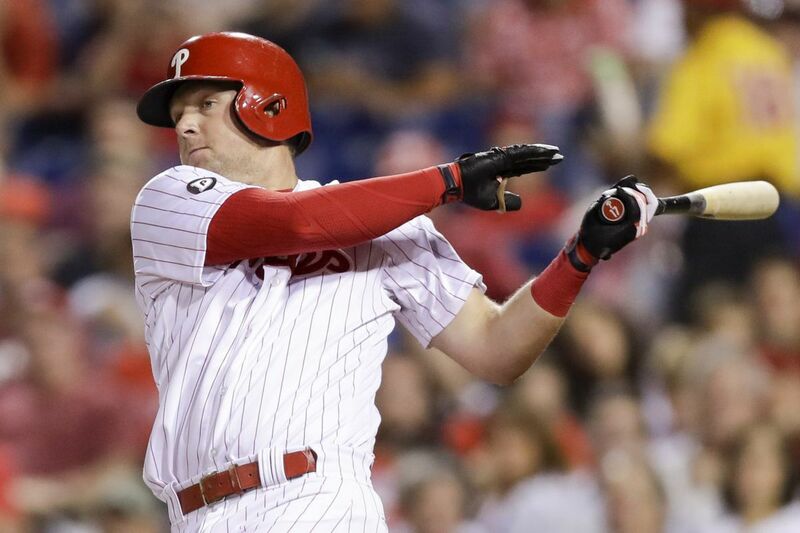 Rhys Hoskins bats against the Miami Marlins on Wednesday. When Rhys Hoskins reached the majors after slugging 93 homers in parts of four minor-league seasons, Joey Davis thought of a parking garage. It is six stories, a constant tease that sits immediately beyond the left-field fence at John Smith Field. The sixth level is a popular spot for Sacramento State pregame tailgating. Baseballs do not often land there. Davis is a Phillies amateur scout who covers Northern California, and he was the one who recommended that the Phillies draft Hoskins. He remembers the day he was sold. It was not because Hoskins hit a ball to the top of the concrete structure. "This is the only guy I've ever totally fell in love with on a swing and miss," Davis said. "This is when I knew we had to get this guy." Hoskins is 24, not yet a veteran of three weeks in the majors. He has generated rare superlatives. He, in 15 games, provided ample evidence as to why the Phillies believe he can become a cornerstone bat for them. He was prepared because of his journey through the Phillies' minor-league system — a journey that involved a scout who lobbied for him, two hitting coaches who shaped him, and an abundance of patience. "All the different people who have their hand in it," Hoskins said, "it's pretty cool." Hoskins had help. But he was the one who added strength, showed a willingness to learn, and applied the recommended adjustments. "He looks like a professional hitter," manager Pete Mackanin said. "He's not afraid to get behind in the count." "He's a professional hitter," said pitcher Jake Thompson, a teammate of Hoskins' in the minors. That is not a label applied to rookies. Davis, who developed a relationship with Hoskins ever since high school, had an idea Hoskins could hit. He was less certain about the power potential. Maybe, Davis thought, Hoskins could be a 15- or 20-homer guy if everything went right. The strikeout made him dream a little more. It was April 22, 2014. Sacramento State hosted Oregon State, the fourth-ranked team in the nation. The Beavers started Dylan Davis, a hard-throwing righthander who two months later was selected 55 picks ahead of Hoskins. Davis that day fired 95 mph, exceptional velocity in college. This was a test. Joey Davis was there. Two important Phillies evaluators accompanied him. One was Darrell Conner, the team's West Coast cross-checker. The other: Pat Gillick, then the Phillies president. The team had the seventh overall pick that summer, and an Oregon State outfielder named Michael Conforto was among the considered prospects. Gillick was there for him. Hoskins was a lower-priority target. He struck out looking in the first inning. He ran a 1-1 count in the third inning, and Davis nudged Conner. "This is the tell-tale sign right here," Davis said. The high-powered fastball was next. Hoskins did not see many 95-mph fastballs in the Western Athletic Conference. He swung hard. He was right on it, Davis said. He missed. "This fastball was elevated," Davis said. "It was up around the letters. If it was down, I swear two inches, this ball would have gone on top of the parking structure. I swear, if it was down two inches." The parking garage beyond left field at John Smith Field on Sacramento State’s campus. The bat speed impressed the Phillies scouts. He did not hit the garage that day. But he homered in the eighth inning for Sacramento State's lone run of the game. It became another note in Hoskins' file before draft time. They selected him in the fifth round, with the 142nd overall pick. Hoskins signed for $349,700. He posted a .408 slugging percentage in 70 rookie-ball games. Nothing remarkable. He flew to Clearwater, Fla., at the end of the season and met Andy Tracy. The Phillies' minor-league hitting coordinator issued one immediate edict: Add a leg kick. Hoskins tinkered with it in instructional league. "Tracy was able to get him more on his back side," Davis said. "He developed that leg kick. By doing that, it gets him on his back side and it really helps him to create some loft and get some power from his lower half." That, Hoskins said, was a crucial moment. "I guess I'm pretty lucky that it clicked," Hoskins said. "I have stuck with it ever since. That was one thing that they said, going home: 'Don't mess with this. Just keep working on it. It might feel awkward even next year, but stick with it.' "
He did. He slugged .518 in 2015. He slugged .566 the next season, at double-A Reading, and started to gain traction within the organization. That is when he started to delve into the mental side of hitting. His tutor was Frank Cacciatore, the hitting coach at Reading. First-base prospects are difficult to tout; they must hit at an elite level because it is the position easiest to replace. What separated Hoskins was his combination of power and plate discipline. His walk rate increased at every level. So did the power numbers. Hoskins said he had discussed hitting philosophies with previous coaches, but Cacciatore was influential. "It wasn't just, 'Let's try to be better than people based on physical talent,' " Hoskins said. "At some point, that runs out — for most guys. There's guys in the game who can get away with it. But that's, what, a handful of guys in the history of the game? "As soon as we started talking about the mental game, it's just one of those things that comes with experience." Hoskins' future is unwritten, but his at-bats have created a sense not felt inside Citizens Bank Park for years. He has mastered every challenge to date, and there are stiffer ones to come. He is aware. Davis visited Hoskins at AT&T Park in San Francisco last weekend and shook his hand during batting practice. They have maintained a close relationship through text messages, but this was a chance to reconnect at a big-league field. No parking garages were visible from home plate. "With scouting, it's a team effort," Davis said. "We have to give them good players, and they have to do a good job of coaching. That's what happens. You have a kid like this who is willing to learn and put in the work. He has the body and the size. So it was worth a shot in the fifth round." The scout thought about Marti Wolever, the Phillies' former scouting director, who approved the pick. Wolever and his boss, general manager Ruben Amaro Jr., have both since been fired. Wolever's draft that summer focused on drafting polished college talent. Davis has worked 18 years in baseball, and only once was he in the actual draft room. It was 2014. The fourth round ended. Davis looked up at the board filled with the names of prospective players in a Citizens Bank Park conference room. A bunch of the columns were gone. "HOSKINS" was listed atop a column on the right side. "Marti looked at me," Davis said. "I nodded my head. And we popped him."